Ventura County Superintendent of Schools, Stan Mantooth, has over 40 years of practical, educational, and management experience in K-12 school districts and the County Office of Education. Beginning in 1996, and until his appointment as County Superintendent of Schools in September 2008, Mr. Mantooth served as Associate Superintendent for Administrative Services with the Ventura County Office of Education. Mr. Mantooth’s specific areas of focus and expertise include financial systems and budget development, personnel administration, collective bargaining, facilities planning and administration, and risk management. Mr. Mantooth has shared his expertise while serving on a variety of statewide committees, including serving as the President of the California County Superintendents Educational Services Association (CCSESA). He is also a member of the Association of California School Administrators (ACSA) and the California Association of School Business Officials (CASBO). 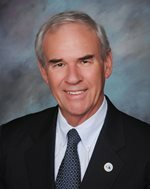 Mr. Mantooth is currently a member and past-Chair of the Board of Directors for the County Schools Federal Credit Union (CSFCU), member and past-President of Ventura County Schools Self Funding Authority (VCSSFA), and past-President of Ventura County Schools Public Facilities Financing Corporation. Mr. Mantooth serves on a variety of local committees and commissions including First 5 Ventura County, Ventura County P-20 Council, Community Commission of Ventura County, United Way, Ventura County Community Foundation, and the Ventura County School Boards Association. Mr. Mantooth has a Bachelor’s degree from California State University, Northridge and a Master’s degree in School Business Administration from Pepperdine University. Mr. Mantooth holds a California Teaching Credential and a California Administrative Services Credential; he has been an adjunct Faculty Member at Pepperdine University, the University of La Verne, California State University Northridge and California State University Channel Islands.